Gollum ate nothing, but he accepted water gladly. `Soon get more now,' he said, licking his lips. `Good water runs down in streams to the Great River, nice water in the lands we are going to. Sméagol will get food there too, perhaps. He's very hungry, yes, gollum!' He set his two large flat hands on his shrunken belly, and a pale green light came into his eyes. Kimi: Gollum! Hey, Sparky! In an earlier [looks around nervously for Penthe] round of discussions, it was noted how often doglike (in a good way) imagery is used for Sam. It comes up in a different way for Gollum, I think. The glowing eyes are reminiscent of the way dog's (cats even more so) eyes can glow green at night when a light is shone on them. Elostirion74: why does Tolkien need to overstate Gollum's evil? Kimi suggests similarities between Gollum and a cat, and I agree as to the eyes, considering Gollum's centuries of living in the dark. The light could also be read as a reflection of Gollum's intense and deep desires and the debate which is almost constantly going on inside him. N.E. Brigand: Hmm. Emotion? That "gleam" in the eyes we talked about months ago? In real-life, some eyes are merely reflective. However, in The Hobbit, at least, Gollum's eyes genuinely glowed in an otherwise unlit space. Like a firefly or deep-sea fish? They were not going quick enough for Gollum. By his reckoning it was nearly thirty leagues from the Morannon to the cross-roads above Osgiliath, and he hoped to cover that distance in four journeys. squire: B. When Gollum was interviewing with Tolkien for the job of antihero and chief ghoul, wasn’t he told there was to be “no math”? dernwyn: This is giving me ideas... ...for another Middle-earth Math quiz! Let's see: if it's 30 leagues to be accomplished in four journeys, that's how many kilometers per hour assuming 12 hours of walking per journey? Tolkien had actually slowed the pace a bit during early drafts, having them travel only 20 leagues in 3 journeys. N.E. Brigand: 30 miles a day is no mean feat, especially for people with half-size legs. Sam found it difficult to do more than doze, even when Gollum was plainly fast asleep, whiffling and twitching in his secret dreams. squire: C. Is this the only mention of Gollum dreaming? What does “whiffling and twitching” imply? How do Gollum’s dreams here relate to Frodo’s dreams? Kimi: And "whiffling and twitching in his secret dreams" is very familiar to anyone who's had a pet dog or cat. drogo_drogo: Gollum's dream and culinary culture shock Gollum's dreams here are "secret," so we are barred from his inner life. Although we don't know the dreams of all the other characters, we can at times enter their heads and see what they are dreaming (especially the hobbit dreams in Book I). Here, though, we sense something conflicted in Gollum's head: maybe a memory of his captivity with Aragorn or some othr struggle, or maybe anticipation of a struggle to come. In any case, Frodo has dreams that are often premonitions, so if Gollum has that capability too (the Ring could be the agency here, though Tolkien was very specific in his writings on foresight), then it doesn't bode well for the future. Elostirion74: Frodo sleeps comfortably, Gollum's dreams are uneasy because he's constantly involved in some interior struggle. Showing Frodo and Gollum dreaming at the same time alerts us to some more basic differences between the two characters. squire: After reading up on the plants involved (full discussion on them tomorrow), I’m convinced that walking the glades of Ithilien was like being in a Sephora showroom that’s been hit by a truck. D. Is Sam’s laugh, or Gollum’s retch, the more realistic reaction? Realism aside, what is it about the scents that repel Gollum? Kimi: Even "Sméagol doesn't like smelly leaves. He doesn't eat grasses or roots, no precious, not till he's starving or very sick" is reminiscent of the feline habit of seeking out just the right grass to eat when they feel the need. Elostirion74: This is one aspect of Tolkien's writing I've come to dislike, his tendency to overstate the moral habitus of certain characters by portraying them as disgusted by Elvish things - Elves have been living in Ithilien before, and it's the mark they've left on the country that would make Gollum retch I believe. I like neither this nor Gollum's allergy to lembas as a device for describing characters and Sam's reaction certainly seems the most realistic and for me the only reaction I need to know. N.E. Brigand: "disgusted by Elvish things" From Letter #328, to a reader who described finding "a sanity and sanctity" in the LotR, with reference to another reader who said in Tolkien's imaginary world, "some sort of faith seems to be everywhere without a visible source." "I can only answer: 'Of his own sanity no man can securely judge. If sanctity inhabits his work or as a pervading light illumines it then it does not come from him but through him. And neither of you would perceive it in these terms unless it was with you also. Otherwise you would see and feel nothing, or (if some other spirit was present) you would be filled with contempt, nausea, hatred. "Leaves out of the elf-country, gah!" "Lembas--dust and ashes, we don't eat that." '"
dernwyn: Gollum, instead of being adverse to lovely aromas, might just have a "fragrance allergy", and be reacting the same way we do when a person wearing an overabundance of cologne or perfume comes close to us. N.E. Brigand: Even lush wildflowers would be unlikely to make me retch, so this is a problem particular to Gollum. Is it the elvish character that others mention, or just a dislike of decent growing things genrally? It reminds me of my own dislike of incense, as in a church. A domestic drama of Gollum and Sam. This time try to re-read the same scenes, from Gollum’s point of view. Frodo's face was peaceful, the marks of fear and care had left it; but it looked old, old and beautiful… Gollum returned quietly and peered over Sam's shoulder. Looking at Frodo, he shut his eyes and crawled away without a sound. Sam came to him a moment later and found him chewing something and muttering to himself. On the ground beside him lay two small rabbits, which he was beginning to eye greedily. Sam, however, had no objection to rabbit at all, and said so. Gollum returned, carrying the pans carefully and grumbling to himself. `Mustn't do what?' asked Sam in surprise. 'Stew the rabbits!' squealed Gollum in dismay. `Spoil beautiful meat Sméagol saved for you, poor hungry Sméagol! What for? What for, silly hobbit? They are young, they are tender, they are nice. Eat them, eat them!' He clawed at the nearest rabbit, already skinned and lying by the fire. Gollum withdrew grumbling, and crawled into the fern. Sam busied himself with his pans. `Gollum!' he called softly. `Third time pays for all. I want some herbs.' Gollum's head peeped out of the fern, but his looks were neither helpful nor friendly. `A few bay-leaves, some thyme and sage, will do - before the water boils,' said Sam. `Sméagol won't go, O no precious, not this time,' hissed Gollum. `He's frightened, and he's very tired, and this hobbit's not nice, not nice at all. Sméagol won't grub for roots and carrotses and - taters. What's taters, precious, eh, what's taters? squire: This is trickier, because the scenes are written from Sam’s perspective. Still, try to think like Gollum for a bit. drogo_drogo: I love this scene, and it's actually one the movie did fairly well, so I'll give them credit for that. dernwyn: Now, the Gollum's-eye view of the cooking quandary. Of course we'd like to help; anything to keep the fat Hobbit off his guard and unsuspicious. Mmm, nice rabbits, it took us a while but we sneaked up on them and wrung their little necks. The fat Hobbit wants them for Master, but Master is asleep, maybe we can eat them now? No? Why get water? Fat Hobbit is not nice, not nice at all, we wouldn't hurt his stupid noisy pans. Water is heavy, grumble. What is this - no, no, you stupid Hobbit! Not fire! No, keep it away from us, from our poor handses! And fire is bright: They will see it! They will come! You do what to our nice fresh meat? Nasty Hobbit, ruins fresh food. Catch another for ourselves? It took us so long to catch these! We will go hungry, yes Precious. Now what does the fat Hobbit want? Search for smelly grasses and plants and - taters? We has never heard of these. Fat Hobbit does not know good things to eat. Cook fish? And what's "chips", eh Precious, and why does the fat Hobbit cook them with fishes? Fat Hobbit is stupid. He will probably make the fire smoke. N.E. Brigand: Gollum sees transparent-Frodo, too. That's important. This is a pre-cursor of what Tolkien calls "the most tragic moment" in the LotR (Letters #246) when Gollum's repentance is spoiled by Sam on the stairs of Cirith Ungol. Here too Gollum quietly sees Frodo's inner beauty and the moment is lost to Sam "smugness...and cocksureness" (Letters #246). FarFromHome: Are you sure? Gollum sees the 'transformed' Frodo who commands him when he makes his oath (or at least we assume he does - it's actually Sam's POV that we have of the scene). But where does he see the 'inner light', which appears to be something else? In the discussion of the oath scene, the consensus seemed to be that the tranformation was caused by the Ring's power, which Frodo was forced to use in accepting Gollum's oath. The inner light, however, seems to be a sign of Frodo's own inner spirituality showing through as he is worn down by his suffering. Or do you think Gollum sees Frodo's inner light here, as he sleeps in the fern brake? That doesn't seem apparent to me - I'd say what he does observe is Sam's love for Frodo, foreshadowing (as you say) the scene where he sees them both asleep on the Stairs of Cirith Ungol. But rather than saying the Gollum sees Frodo's inner beauty either here or on the Stairs, I would say that Gollum sees, and is inspired by, *Sam's* response to Frodo's inner beauty. It's all the more tragic then that Sam's love for Frodo is the very thing that prevents Gollum's impulse from coming to fruition. Gollum returned quietly and peered over Sam's shoulder. Looking at Frodo, he shut his eyes and crawled away without a sound. Sam came to him a moment later and found him chewing something and muttering to himself. On the ground beside him lay two small rabbits, which he was beginning to eye greedily. And so Gollum found them hours later, when he returned, crawling and creeping down the path out of the gloom ahead. Sam sat propped against the stone, his head dropping sideways and his breathing heavy. In his lap lay Frodo's head, drowned deep in sleep; upon his white forehead lay one of Sam's brown hands, and the other lay softly upon his master's breast. Peace was in both their faces. But at that touch Frodo stirred and cried out softly in his sleep, and immediately Sam was wide awake. The first thing he saw was Gollum – 'pawing at master,' as he thought. The "quietly" and "softly" may mean something as well. Tolkien says that Sam misses Gollum's changed tone here. Maybe Gollum "shut his eyes" the first time because he didn't want to see. linkinparkelf: Yes, that struck me too Sam and Gollum almost share an unspoken moment there don't they, neither saying anything about what they see or think about Frodo but both moved in their separate ways. Sam is not disturbed by Gollum's presence either, acknowledging the fact that Gollum is moved as well. And Gollum closes his eyes and walks away. Quite a sad moment actually. FarFromHome: The two passages are crucially parallel, I agree. I guess the question is how to interpret the relationship between them. Here's my current thought: both here and on the Stairs, Gollum is moved by the relationship of Frodo and Sam - Frodo's trust in Sam, Sam's protectiveness of Frodo. In this first scene, as you point out, Gollum closes his eyes and crawls away. He's moved, but he doesn't understand it, perhaps, and pulls away. On the Stairs, he does allow himself to act on his feelings. But there's a lot of complexity for all three characters at this point. Remember that Frodo has accepted Sam's protection in agreeing to sleep with his head in Sam's lap and Sam's arm around him, so that "no one can come pawing you without your Sam knowing it." But Sam awakes to find he has betrayed Frodo's trust in him by falling asleep. Frodo's trust, and Sam's protectiveness, the very things that have moved Gollum to a moment of repentance, are the what now stand in his way - Sam wakes up, and with that sense of guilt and remorse for his lapse ("I shouldn't have been sleeping"), overreacts. There is another parallel between these two scenes that I mentioned in another thread, but perhaps it's relevant here as well: after Frodo and Sam have eaten some stew, Sam calls out to Gollum and invites him to come and have some too. And after the hobbits have their philosophical, consoling conversation about stories on the Stairs, Sam calls out and invites Gollum into the conversation - asking him if he wants to be the hero or the villain of the tale (nice bit of foreshadowing right there, I think!). But Gollum has gone - probably to save himself from the Rangers in the first scene, definitely to betray the hobbits to Shelob in the second. Sam, then, in his own rough-and-ready way, gives Gollum two opportunities to be included in the relationship, but Gollum is busy with his own selfish ends at the time and misses them both. squire: E. Why is Gollum so helpful at first? N.E. Brigand: In part, he's got to keep up a facade until they reach Cirith Ungol. He's also got to enjoy some fresh water in Ithilien. And he's genuinely improving. squire: F. Does Gollum really expect the hobbits to eat raw rabbit? drogo_drogo: Now Gollum has lived on a diet of raw meat for centuries, so he probably cannot even digest cooked meat. He would also have an aversion to roots and plants having lived in a cave (the produce sections of the Orc stores in the Misty Mountains are pretty lean! :)), hence his aversion to the very idea of a stew. N.E. Brigand: Has he eaten with anyone in 500 years? Thus far he's only seen the hobbits eating bread. But what did the elves feed him in Mirkwood? squire: G. Why is Gollum already grumbling when he returns with the water, before he sees the fire? N.E. Brigand: He's had to fetch water, and carefully, without being told why. squire: H. Is Gollum reacting to the fire because of the pain that fire causes, or the risk of drawing attention? Why does he hate fire so? Kimi: Fire: Gollum seems frightened of it. I wonder if it was part of his torture in Mordor. Gandalf, too, admits to having threatened him with fire. Gollum doesn't seem to have the ability (or the desire) to make fire for himself. It is something to be feared, not used. His eating of raw meat emphasises his "uncivilised" state. Elostirion74: Could be both. Gollum is probably afraid of fire, since he doesn't know how to make a fire for himself, another mark I believe of his uncivilized state. N.E. Brigand: Torture? Whatever it was that Sauron did to his hands? There's probably something more here, but I'm not catching it. squire: I. Why does Gollum show an interest in what ‘taters’ are, in the middle of refusing to look for them? What does Gollum think of “roots”? drogo_drogo: I assume he thought a "tater" was some kind of rodent--an animal, not a vegetable. N.E. Brigand: Ah...we were told some time ago that Gollum went searching for roots (of mountains) and was disappointed. squire: J(1). Was there any chance here that he and Sam might have come to a better relationship, judging from Act I? Who is more at fault for the debacle of Act II? Why does the reconciliation of Act III fail? Kimi: I find a sad near-meeting between Sam and Gollum here. I think it's another "if only" moment. Had Sam been a little kinder (like for instance letting Gollum keep some rabbit for himself! I can see why he feels hard done by), Sméagol's chances of repenting *might* have been strengthened a little. But I do find Sam's disgust credible. Gollum's eating habits would be fine in an animal; in a near-hobbit they're... off-putting. drogo_drogo: Now this sets up a cultural conflict with Sam, since it would be the same if Mr. Gamgee when into a sushi bar and was forced to eat tuna rolls. Sam unfortunately is not be as culturally sensitive as he should be to Gollum's dietary habits (we'll call it that, though Gollum has one weird Atkins-gone-crazy diet of his own making), but Sam's still growing. Perhaps a cultural exchange program would have helped. Sam could spend a fortnight in Gollum's cave eating preciouss fishes, and Gollum could stay with the Gaffer gardening and eating second breakfast. Elostirion74: Sam is actually not hopeless as to his manners at the start, but from Act II I really dislike his behaviour, so often acting with distrust and open disrespect, treating Gollum almost like a slave and resorting to stupid threats. A bad habit he's got from his father perhaps? No wonder Smeagol's grumbling to himself when he returns. They could've approached each other with more respect after this situation if Sam only made more of an effort to be nice. In Sam's defence one could say that Gollum's not exactly very good at relating to other people - haven't had much experience either - and show some understanding of their preferences if they differ much from his own. dernwyn: I'm afraid that any reconciliation between Gollum and Sam is hopeless - they just can't cook: they'll start off coddling each other, but then each will cause the other to blanch, and the whole relationship will flambé. an seleichan: had some trouble digesting this post but I agree: this Sam-Gollum relationship will never gel no matter how many times it's stirred. N.E. Brigand: It's Sam's fault, because more is to be expected of him than Gollum. squire: J(2). What does Gollum look like, that these Men seem in some doubt if he is human? N.E. Brigand: He's small and doesn't walk upright. squire: K. Summary: Instead of focusing on ‘good and evil’, use this chapter’s extensive passages to discuss Gollum in terms of emotion and intellect, or childishness and maturity. How smart is he? How good are his people skills? What part of Gollum is ‘normal’? N.E. Brigand: Gollum is crafty but quickly overcome by his emotions. It also may be useful to remember that he too is a hobbit: perhaps he exhibits, to turn back to Letter #246, "a vulgarity--by which I do not mean a mere 'down-to-earthiness' -- a mental myopia which is proud of itself, a smugness (in varying degrees) and cocksureness, and a readiness to measure and sum up all things from a limited experience, largely enshrined in sententious traditional 'wisdom.'" 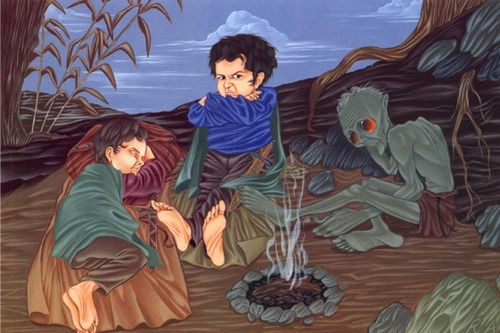 In addition to that, Gollum is a "mean little soul" (Letter #214) and has regressed under the influence of the Ring.